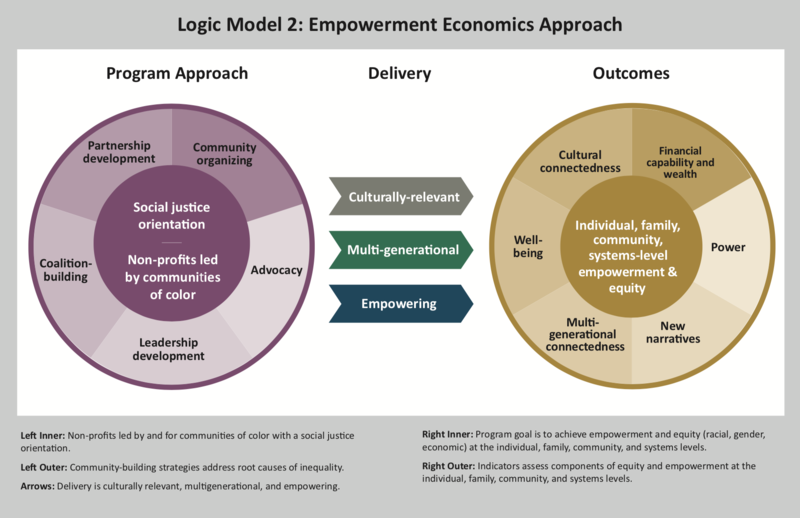 Empowerment Economics is a culturally responsive multi-generational approach to financial capability in low-income Asian American and Pacific Islander (AAPI) communities. 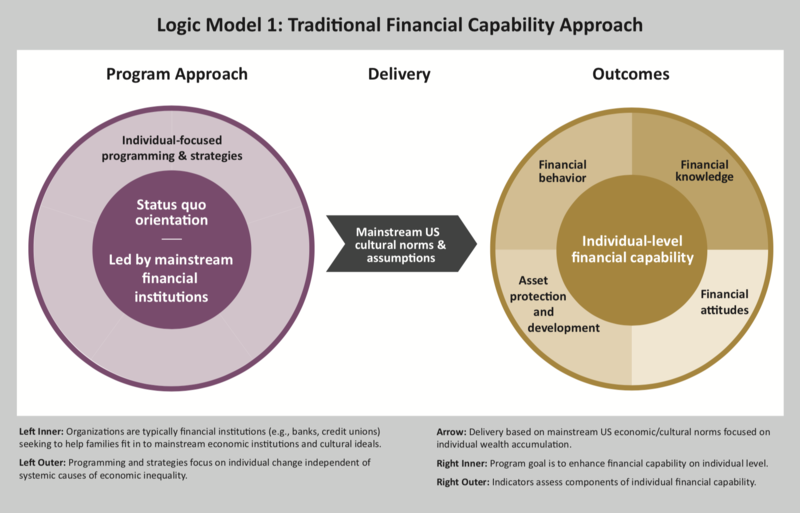 Traditional financial capability focuses on wealth building at the individual level. In contrast, Empowerment Economics focuses on collective wealth building at the community level. Empowerment Economics creates transformational opportunities for building community self-determination and wealth. Empowerment Economics provides a framework of various elements that have been effectively used in low-income AAPI communities. The term Empowerment Economics was developed by researchers from the Institute of Assets and Social Policy (IASP) at Brandeis University’s Heller School for Social Policy and Management and was based on the financial capability practices of Hawaiian Community Assets (HCA). 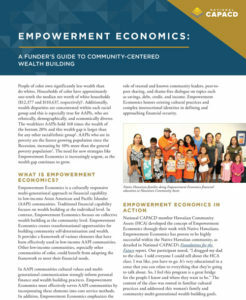 National CAPACD funded this work and continues to investigate and develop the idea of Empowerment Economics as a practice which is valuable to many AAPI communities and other communities of color. If you would like to learn more about Empowerment Economics and how you can incorporate its principles into your work, please contact National CAPACD at rosalyn@nationalcapacd.org. Cultural values and multigenerational communication strongly inform personal finance and wealth building practices in AAPI communities. 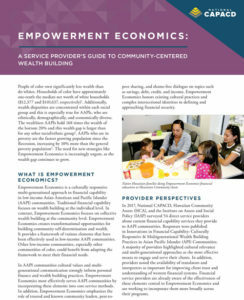 Empowerment Economics most effectively serves AAPI communities by incorporating these elements into core service methods. In addition, Empowerment Economics emphasizes the role of trusted and known community leaders, peer-to-peer sharing, and shame-free dialogue on topics such as savings, debt, credit, and income. Empowerment Economics honors existing cultural practices and complex intersectional identities in defining and approaching financial security. Innovations at these intersections represent exciting directions for transformative policy, practice and philanthropy. Hawaiian Community Assets’ approach to financial capability combines a set of promising practices that are embedded in everything they do and provide guidance to other organizations developing similar programs. These promising practices support organizations led by, and for, communities of color who seek to develop greater financial capability and cultural self-determination, while working to close the racial wealth gap. Cultural values help inform our actions. Participants in financial capability programs adopt financial capability concepts if they can draw connections between their cultural values and the purpose behind and/or benefits of learned wealth-building strategies. Talking about money, especially family financial struggles, often evokes emotions and vulnerability. Program participants can engage with financial concepts and discussion of family finances in a safe and supportive environment with peers who can directly relate to their own experiences. The kind of learning that stays with us often organically comes from our social and family networks. Program participants invited to participate in financial capability programming with their families may find the learning environment to be more accessible, motivating, and meaningful. Families may be wary of financial institutions that they are unfamiliar with or from past negative experiences. Community-based organizations with established relationships and a trusted reputation are more likely to successfully reach and recruit participants who may benefit the most from financial capability programming. The Foundations for the Future Report is a case study focused on Hawaiian Community Assets (HCA), and demonstrates how the organization worked closely with its members and partners to build wealth in Native Hawaiian communities through financial capability programming. The authors introduce the term Empowerment Economics to categorize this process and expand upon current approaches to financial capability. On the surface, what HCA offers to families is a classic financial capability program. But digging deeper into their approach, we found the seeds of empowerment economics in how these services and educational opportunities are designed, implemented in the community, and spread across generations. Empowerment Economics is a culturally rooted approach to financial capability and asset building that reflects a community’s ancestral cultural values and sociopolitical history with wealth. Empowerment economics, the intersection between financial capability and culturally relevant and multigenerational programming, is an asset development framework that seeks to build wealth and power. 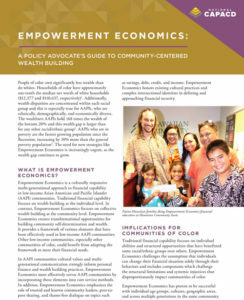 The Innovations in Financial Capability Report builds upon the previous report, Foundations for the Future: Empowerment Economics in the Native Hawaiian Context, and features the financial capability work of over 40 of our member organizations and other AAPI serving organizations from across the US. 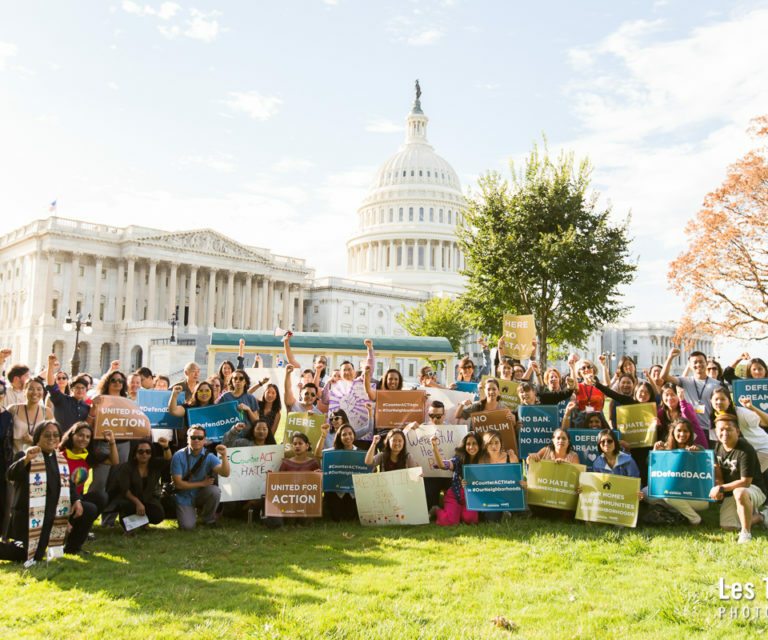 The report finds that AAPI leaders across the country are adopting innovative multigenerational and culturally responsive approaches to financial capability programming, but they want and need more supports for their work. The Federal Reserve Bank of San Francisco partnered with National CAPACD and IASP to publish the Evaluating Empowerment Economics report as a part of their new Open Source Solutions series. The report shows how Asian American, Native Hawaiian, and Pacific Islander (AAPI) leaders are protecting and building wealth and power at the community level. The Evaluating Empowerment Economics report is a preliminary evaluation framework that makes visible the innovative approaches and potential outcomes associated with Empowerment Economics. IASP developed this framework with National CAPACD and HCA through a review of the current research on financial capability evaluation. The framework explores the program and evaluation practices of thirteen regionally diverse National CAPACD member organizations. Listen to the recorded webinar from the UCLA Asian American Studies Center, #NotCrazyRichAsians. The webinar shares findings from the Foundations for the Future report featuring Hawaiian Community Assets, National CAPACD, and IASP's Empowerment Economics model of financial capability programming and from soon-to-be-released research on asset building in the Cambodian community through the lens of small business ownership from UCLA for the Ford Foundation's Building Economic Security over a Lifetime Initiative.